Another informative post from one of our iD Gaming Academy Regional Managers Latonia on the benefits of 3D modeling classes. Enjoy! The world of 3D is wide-ranging. From the TV commercials we watch, to the video games we play, or even the sneakers we wear…3D visualization has played a part in their creation. If you’re thinking about a career in the 3D industries or simply getting experience with the software, you can’t go wrong. This is even more so for those of you who thinking about becoming designers and working on the conceptual side. Representing and understanding design concepts in a 3D format is not the easiest (nor the most obvious) thing to do, but it is a lot of fun. As designers, in addition to creating, you will need to present your iDeas...whether they are about a video game, a car, a house, or a spoon. And the sooner you’re informed about your own creations, the more likely those creations will be successful end products. As a college professor and iD Gaming Academy Maya course instructor, I have found that exposure and practice does in fact make better. You don’t have to possess prior experience to take a 3D modeling class, and you’d be surprised at how much exposure you’ve already had before you even get to camp. Like I said, the world of 3D is wide and diverse – it’s practically everywhere. There are several ways to gain a deeper experience with the software, and taking a course in 3D modeling and animation is one of them. As a young architect, I trained myself – learning how to build 3D computer models by trial and error and by using books. While this was fun for me, it resulted in more “error” than anything else. I was learning both 3d Studio Max and Maya but this self-training method only got me so far (I had so many questions!). It wasn’t until I took a class where someone sat with me, showing me the correct and more efficient process of building 3D models was I of any real use professionally. Suddenly, I was able to build and animate 3D models faster – plus they looked a lot better! More importantly, I began to realize I really liked designing in 3D and seeing the endless possibilities of using software like Maya. 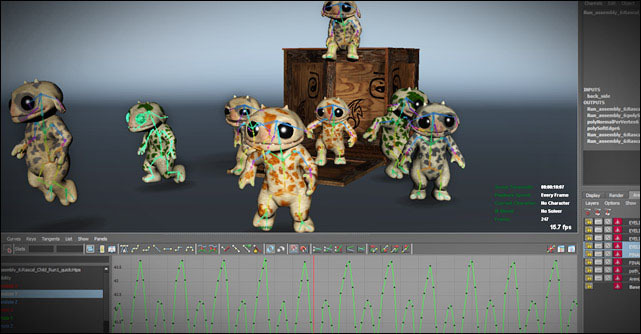 There are so many 3D modeling and animation software packages out there from which to choose, such as Autodesk’s Maya, or ZBrush, or Accurender. At iD Tech Camps and Teen Academies, we offer 3D modeling and Animation classes using Maya. Our classes teach software that is used by professionals and that can be used across many 3D industries – from gaming to film to industrial design. There it is again, that exposure value. I’ve always said the best way to find a career you’re passionate about - or a hobby you love is - to constantly find experiences that are related to the things you love to do (or play). If it happens to be video games, or architecture, or watching those cool special effects you see in movies, try taking a 3D modeling and animation class during the summer for some inspiration. Take care and see you this coming summer!